Drain and rinse a 410g can chickpeas, then pat dry with kitchen paper (if using dried, follow instructions on packet). Blend in a food processor until puréed. Add ½ chopped onion and a handful each of flat-leaf parsley and coriander, along with 2 crushed garlic cloves, ½ tsp ground cumin, ½ tsp ground coriander, ¼ tsp bicarbonate of soda and ¼ tsp salt. Blend again. Chill for 30 minutes. Stir 1 tbsp plain flour in, then shape into 8 patties. Deep fry for 3–4 minutes until golden brown. Drain on kitchen paper. For dressing, whisk 1½ tbsp tahini, 1 tbsp water, juice of ½ lemon and a pinch of ground cumin. 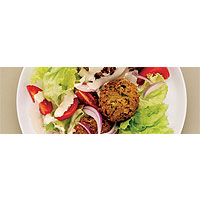 Serve with lettuce, red onion and tomato salad and the dressing.